True or False: Is Climate Change Really Caused by CO2? The answer to that question is: yes and no. The climate debate has become hotter than ever. There are many people who doubt the mainstream ideas that climate change is CO2-driven, but on what kind of science do these people base their ideas? Or is it merely a belief to comfortably keep driving their big SUVs without feeling guilty? On the other hand – what exactly are the agendas of believers in anthropogenic climate change? Our research shows that the facts are quite surprising and that both sides are right and wrong. The atmosphere is in “equilibrium”. Fig. 1: This map gives a good indication of what happened over the last decades – at ground level. Some areas are heating up, while others are cooling down. The Southern hemisphere cools down, the Northern hemisphere warms up. The global result seems to be a global warming up. What is the cause? The temperatures per year noted at the left and percentages noted at the right indicate the significance of temperature change. For example, changing temperatures at the equator have more impact on a global scale than temperature changes at the poles. | © 2016-2019 by Mario Buildreps. What constitutes “climate”? Traditionally, temperature, humidity, wind speed, rainfall, and sunny hours give a good idea of what defines “climate”. When the patterns of these five variables permanently change on a significant scale, we could speak of a changing climate. Is this ever properly analyzed on a global scale? Hardly. This is because earth’s climate is an amazingly complex system and is still far beyond the reach of human comprehension. So, we ask: Is our climate really changing? And if that is so, why could it be changing? It is widely believed, particularly in climate change discussions, that we can control the climate, as we do in our cars, by reducing CO2 emissions. But a glimpse at the historical data shows us that temperatures changed constantly over time. Who or what made this CO2 a few hundred thousand years ago? Or is CO2 the effect and not the cause – because that would explain the issue much better than vice versa. Is our climate changing? If that is the case, what is the probable cause? To see what is really going on, let us determine this by ourselves. But that requires a lot of work. Few people are willing to do that gratuitously. Fig. 2: The Northern hemisphere warms up, and the Southern hemisphere cools down – at ground level. The net result of both, based on about 100 weather stations, is a global warming over a period of about 50 years. Extrapolated, the atmosphere would have warmed by some 0.7°C over the last century. But is that true? Do we get the full picture of what is happening to the atmosphere if our data is based only on ground stations? | © 2016-2019 by Mario Buildreps. Fig. 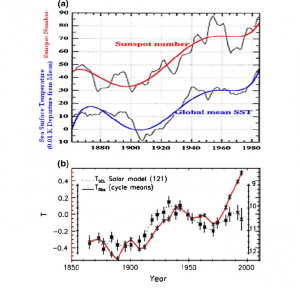 3: The number of sunspots and the Sea Surface Temperatures (SST) show a clear relation. But sunspots can only account for temperature swings up to plus/minus 1.4°C, so 2.8°C in total between the highs and lows. 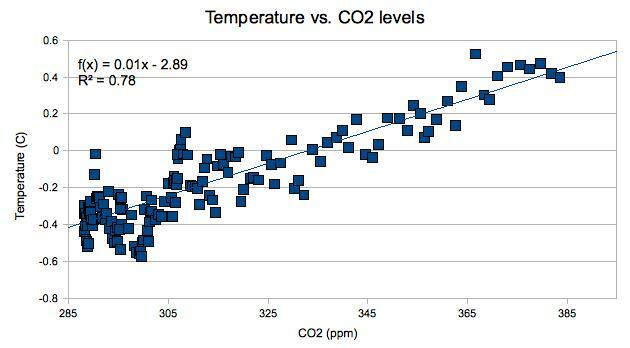 The correlation between CO2 and temperature is obvious. Whether we look at recent records, or at ice core data, the correlation is always present. Is the simple conclusion that CO2 is responsible for climbing temperatures true? Is it really THAT simple? The relationship is indeed so obvious that only a fool dares to say that CO2 is not responsible for climate change – or so it seems. Some cases of cause and effect are simple and obvious: Does asbestos cause cancer, or does cancer cause asbestos? Because asbestos preceded cancer, it is the probable cause. But not all cases are so logical. We ask: Does CO2 cause climate change or does climate change cause a change in CO2 levels? Here is another case of cause and effect: Are the wheels of a car responsible for heading in a certain direction or is it the turning of the steering wheel? There might exist some odd cases where the former situation is valid, but the wheels/steering components are so tightly connected to each other, that, if we would not know better (we have never seen a car before), we would have a very hard time to see objectively what the cause is and what the effect might be. When we change our direction of travel, the tolerance in the system would be the only way to find out the cause. This is called hysteresis. What lags behind would be ipso facto the effect. We would discover that the steering wheel is the cause of the wheels to change direction. Grasping this principle is crucial to also have a better idea regarding our climate. We claim that regardless of what climate scientists refer to, CO2 is ultimately not the main cause, simply because CO2 is a proxy, a reactor on changing temperatures. Fig. 4: The relationship between CO2 and temperature change is obvious. Denying that there is a relationship means being in denial. But the real question must be: Is CO2 the cause of temperature change or is it the effect? And if CO2 were the effect, what else could cause these temperature changes? If we analyze the data by zooming in, we see that CO2 lags behind on the temperature data. Is this well known? The climate scientists know about it but they stubbornly ignore this problem. It is the elephant in the room. Earth’s climate system is a feedback system. There are causes and there are effects. We must distinguish between these two to understand how such complicated mechanisms work. When the alleged cause is lagging behind we can easily understand it is nothing more than an effect that is caused by something else. This “something else” however might be unknown to us. We could concoct some unimaginably complicated system to fake CO2 as being the cause. But why would we do that? Only scientists with a false agenda do this. To become aware of the fact that CO2 is lagging behind temperature you must zoom in on the data. It is crucial to grasp that, if you want to know which is causing what, you need many detailed data to show where the reversals are, where the direction changes, as in the graph shown below. The lag between input and output is what we have referred to as hysteresis. In the graph below, there is not one single example where CO2 is not behind on changes in temperature. The odds for that correlation to be coincidental is 2.33×10-10 or 0.00000000233%. Therefore, we can say with 100% certainty that CO2 is NOT responsible for climate change – hence CO2 is the EFFECT and it correlates with changing temperatures. About 85% of the measuring stations are on land, while land covers only about 33% of the planet. It is not difficult to see that, when we use this data, we introduce major errors when we try to calculate an average global temperature. Fig. 6: There is a striking relationship between recent reduction in the number of weather stations and the global rising temperature. After the collapse of the USSR about half of the COLD stations fell into disuse, resulting in an alleged rising of global temperatures. About 50% of the stations that are used to measure global temperature are situated at airports. Many of these stations are incorrectly located, meaning that they collect heat from the exhaust of airplanes or from the tarmac runway. Since the air traffic has increased, the heat collection by the sensors from the jet exhausts increases as well. The short and intense heat bursts of the engines accumulate to result in serious errors of many temperature measurements. Most other stations are in expanding urbanized areas. The measurements are affected by growing traffic and growing heat radiation of buildings over the last decades. The explosive growth of air conditioners on buildings add an enormous heat source to cities and therefore influence the measurements of urban-situated weather stations. The measurements from some of the stations in large urbanized areas must be corrected by other nearby remote stations before they can be used to present a global warming map. And even if we do this, we still present only the temperatures at ground level. We have no idea what happens higher up in the atmosphere, and deeper down in the oceans. How Accurate Are the Temperature Measurements? 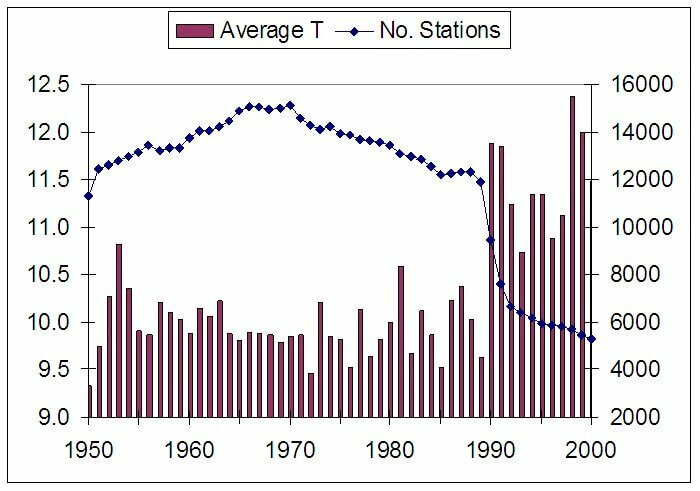 After the collapse of the Soviet Union in 1991, the number of weather stations dropped dramatically from about 12,000 in 1990 to about 6,000 stations in 1995. In the same period, the alleged global temperature started to rise dramatically. Cause: the “cold” stations were gone from the statistics. Mainly the warm urbanized stations remained. Effect: the statistics started to present a distorted picture of the global temperatures. Recently, a far better way of collecting data has come into use: Remote Sensing Systems, or shortly RSS. Satellites gather data over large areas by using microwave sensors. This data is much more reliable and much easier to process than the old-fashioned weather stations that climate models are still based on. Table 1: The results from the RSS scans over the last 20 years shows a whole other picture than what the ground stations are showing. The lower atmosphere is indeed warming up, possibly due to rising CO2 levels. But the higher atmosphere is cooling down so fast that even while it is much less dense, it compensates for the warming lower atmosphere. The atmosphere, when regarded in its totality, is in EQUILIBRIUM. | © 2016-2019 by Mario Buildreps. Fig. 8: When we integrate the whole atmosphere into our research, we find a zero sum. We will not intimidate you with the difficult math behind our discoveries. Take our word for it – the temperature of the atmosphere remained the same. Of course, at ground level, the temperatures are rising over the course of a few decades, but the mixing and convection process compensates for the large differences. | © 2016-2019 by Mario Buildreps. Why is the Atmosphere as a Whole in Equilibrium? Over the last two decades, the atmosphere as a whole is in equilibrium. The lower atmosphere warms up, while the higher atmosphere cools down. Indeed, the greenhouse gases partially trap the collected warmth in the troposphere, but because the stratosphere receives less back radiation through the CO2 blockade, it cools down very rapidly. The sum of both remains the same. The higher stratosphere then becomes affected, due to the CO2 blanket, by the much slower convection and mixing processes in the atmosphere. Large amounts of emitted CO2 cause a sort of “flash heating” in the lower atmosphere. But this heat will never be entrapped for very long due to convection and mixing. When we look at the short-term aspects, it causes sudden melting of Arctic and Antarctic regions. In the longer term, it causes periods of melting and periods of extreme freezing – a less stable climate with more extremes indeed. It is crucial to understand the concept of equilibrium to fully understand the processes in the atmosphere. Eventually, the strongly cooled stratosphere will receive what it is entitled to, although it might take some time. That is why both sides are right and wrong. The truth is in the nuances present in both viewpoints. Fig. 9: Our discovery that the atmosphere as a whole is neither warming nor cooling is very important. It shows that the biosphere is much more of a complex feedback system than science has ever recognized it to be. Of course, glaciers can melt due to Human CO2 emissions, but one must realize that the balancing system of the Earth repairs such imbalances within a relatively short period of time. | © 2016-2019 by Mario Buildreps. Where Does All the CO2 Come From? The increase of CO2 from 290 ppm to about 400 ppm over the last 100 years is mainly caused by the warming of the oceans. The oceans contain about 98% of all the carbon in the biosphere. The release of CO2 is partially caused by the above-mentioned sun cycles, and by the rebound effect of the last ice age that ended some 12,000 years ago, which was, in fact, a crustal deformation. What many people do not know is that seawater is especially able to dissolve huge amounts of CO2. When temperatures of the oceans drop, seawater will dissolve more CO2. Is this CO2 then again released when the temperatures of the oceans rise again? There is ipso facto a strong correlation between temperatures and CO2 – but the water temperatures of the oceans decide at what levels CO2 is released into the atmosphere. This is precisely what happened after the termination of the last ice age. The ocean temperatures bounced back up again. Additionally, a few midterm oscillations accumulated and caused constant small swings around the “setpoint”. Therefore, CO2 is behind in temperatures. The small CO2 variations we saw over the last three decades are caused by ocean currents driven by varying amounts of solar activity. The midterm variations, like the Medieval Winter, were caused by the Hallstatt cycle. The large CO2 increase over the last 12,000 years is the rebound effect of the last major ice age. And of course, if our civilization emits high amounts of CO2, that would then cause what we have called “flash heating”, and that is what we see today. But this flash heat will remain only for a short while in the lower atmosphere. We will experience in the coming decades the effects of the cooling of the lower atmosphere as the result of convection and mixing with the higher atmosphere that, in the mean time, cooled down as much as the lower atmosphere has been warmed up. Don’t throw away your warm coat too soon! Fig. 10: The Earth’s crust has been deformed significantly over the last 350,000 years causing large changes in climatic zones. Researchers who have taken ice core samples from Antarctica with the assumption that the crust was rigid have concluded that the Earth experienced a series of “ice ages”. However, the fact remains, proven by ice cores and tree rings, that Earth’s temperatures did not change more than 2.8°C (±1.4°C) over the last half million years. | © 2016-2019 by Mario Buildreps. What Caused the Large Temperature Changes? The biggest remaining question is: what caused the very large long-term temperature swings of the last glaciations? El Niño and El Niña? No. Earth Crust Shifts are rejected and even ridiculed by geologists, while they offer the only rational explanation for the very large long-term temperature swings around the “setpoint”. We have gathered an incredible amount of data and are sure that crustal deformations are the only explanation for what science has called “glaciation cycles”. What happens with ice core samples considering the assumption that the crust was fixed? The interpretations will lead to conclusions of very large temperature swings, which in fact never took place. Shifts in climatic zones, which are not recognized as such, lead automatically to the idea that the Earth was in a series of ice ages, while there is never any mechanism that was found to have caused such frigid events. Read the article on our home page and you will understand how it works. Earth crust deformations were responsible for large climatic changes over many hundreds of thousands of years. They were caused by the high eccentric orbits of Earth around the Sun. That is the reason ice ages relate so well to the earth’s orbit eccentricity. Today, we are still in the rebound of the last crustal deformation that terminated 26,000 years ago. This rebound effect causes the present temperature to still rise a little, which in turn causes the warming of the oceans, which in turn releases CO2. This is the chain of cause and effect regarding the all-important subject of CO2. On the question, who is right and who is wrong, the answer is: They are all right and wrong at the same time. One must look at this issue from a wider perspective. Only then you can see that both perspectives contain parts of a much bigger picture. Did my detailed comment go thru. How sad it is that climate alarmism, fed by the green movement, vested interests, governments & gullible media now fuels a shockingly wasteful trillion dollar industry that costs the earth but does nothing to save it. In the meantime, more pressing problems facing humanity such as poverty & REAL (not co2) pollution are unchecked. (This is made clear in your example re NASA abandoning satellite temperature monitoring technology, not because of funding shortage but because this more accurate system didn’t fit their agenda). One thing missing in your earth crust causation of glacial periods / climate change is the Younger Dryas period comet /s that thrust the earth back into a deep freeze (when it was just emerging from the last ice age) some 18,000 years ago, causing crust distortion, volcanic upheaval & massive scale melting of the North America & European ice sheets. Once a theory that was laughed at by now almost entirely accepted. Thus regular bombardments of the earth in the past are large contributors to long term climate change patterns. (And surely sunspot activity the main contributor to short term climate change – eg., the “little ice age”, lasting over 200 years around the 16th century where it was well documented by scientists & astronomers that there was substantial reduction in sun spot activity). In past periods of cold, humanity & life on earth have suffered. In warming periods, we & life have flourished- so much for “global warming “ harming us….! Thank you for your comment, Paul. We have done with our small team many months of research to this topic without knowing where it would be heading to. I was as surprised as everyone else. But if you give it a thought it is so obvious and logic that it is astounding to see that we with our small budgets and small team had to come up with these results. This is not the last article on this topic. We will maybe publish a paper on this topic as well. The real problem, pollution of (nano)plastics in our oceans and the whole food chain, does not get the attention it should have. Thanks again for your visit and your support. My personal feeling about the whole debate has generally always been “I don’t want to poison the air or the water” – who wants to breathe in terrible stuff and kill of our wonderful oceans, lakes and rivers. I personally feel it would be a far less polemical way of talking about our over-consumption of non renewable energy sources. Nobody wants to dirty their own back yard. Thank you for your comment, Chris. I fully agree with your stance. Pollution is a serious problem. The question however remains whether CO2 causes climate change on the long term; that is highly questionable. Most probably not.